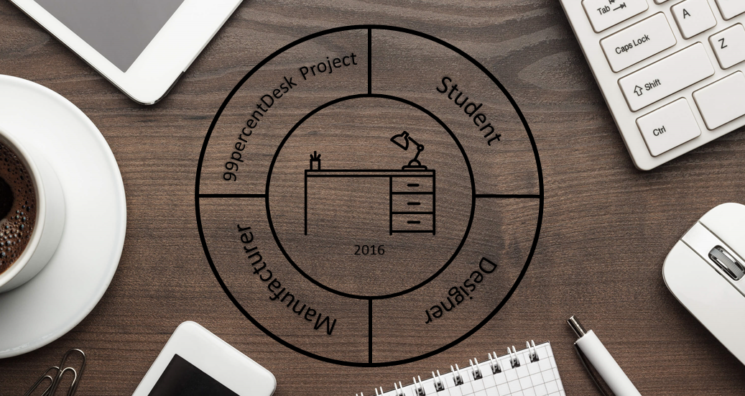 The 99PercentDesk project is the brainchild of a Master’s and final year student in Industrial Engineering from the University of Stellenbosch. To create a study desk through the principles of Social Manufacturing that will satisfy the needs of the 99th percentile student. There is a shift in the modern day manufacturing trend towards a more sustainable method. One where the community (that means you) creates value by combining manufacturing with Open Design platforms. These Open Design platforms enhance the design process by enabling local and global communities to contribute to each step in product creation. After all, we live in an age where every jack is a master of all trades – so why not share it on platforms that allow you to build what is in your brain. But it doesn’t stop there. With that simple design, be it on paper or CAD software, you can connect to smart factories from the comfort of your home and manufacture the design. Have it assembled and delivered to your doorstep by third party services in time to fetch the morning paper. This is the Social Manufacturing process chain in a nutshell. Each step from design to delivery is accessible to the customer to add his/hers personal touch. Furthermore, each step is performed by a different party the distribution of wealth is far more effective than ever. With enough funding we can design and manufacture two prototype desks that will be used as a validation experiment for a Social Manufacturing business model. The desks will be designed and manufactured through the community of Stellenbosch and then donated to a student in need and the Faculty of Engineering. Please back our project by funding this project or participating in the project itself by being part of the design team. It’s easy just Like and Share the Facebook page (https://www.facebook.com/StellenboschSM/) to create awareness and add features you think a student will require to the already established design provided!